Take a pan and fry cashews till golden brown and set aside. Keep a tray ready greased. Heat coconut and sugar together & mix well. Stir constantly in medium flame. Then sugar will melt and form a thick liquid. Continue this until the mixture starts leaving the pan and forms a foamy whitish bubbles while stirring. Color should not change. Add cashews, elaichi powder & mix well. Then pour immediately to the greased tray and press it with a greased aluminium foil to give it a smooth finish. Cut in to any desired shape while it is still warm. 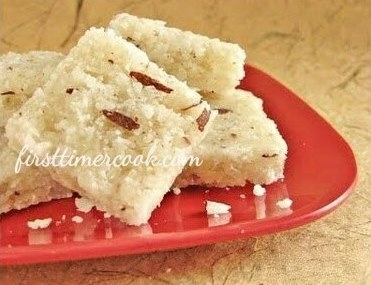 The time taken to get the perfect consistency of burfi varies upon the pan thickness, heat and moisture in coconut. Don't set the mixture in tray for so long until it cools down, otherwise it will be very difficult to make pieces. Sharp knife / pizza cutter / cookie cutter can be used for giving shape. Stirring should stop immediately after the consistency reached, otherwise the sugar'll get caramelized and color will start to change.